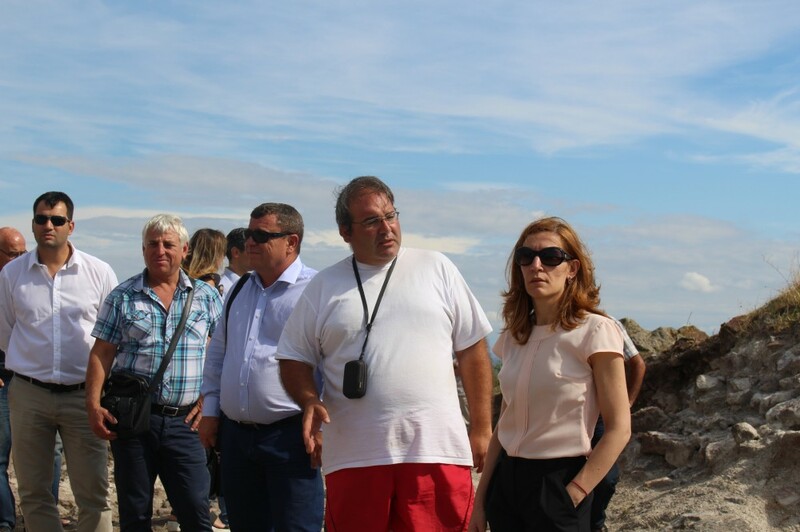 The Minister of Tourism, Nikolina Angelkova, visited the Rusokastro fortress to see first-hand the archaeological explorations of the site and the conservation work performed on the unearthed structures. She was greeted by the Kameno mayor, Zhelyo Vardunski, and the Municipal Council chair, Radoslav Boyadjiev, who shared with her the Municipality’s plans to develop the site as a tourist attraction. According to scholars, this was one of the biggest-scale defence facilities, with a well preserved 14th century flooring having been discovered there just days ago. „It is a site of big potential, not just because of its scale, but also due to its location. Some of the most frequented Black Sea resorts are in the vicinity, with proactive advertising this site can welcome tens, even hundreds of thousands of tourists a year“, Minister Angelkova said. She emphasized that it was very important for work to continue on the exploration of the site and creation of further services for the tourists. „On our part, we are ready to support promotion of the fortress on a national level, but it is important to have something to show to the tourists when we focus attention on it“, Nikolina Angelkova added. Mayor Vardunski and the head of the archaeological explorations, Milen Nikolov, displayed to the Minister the work performed thus far. For the first time funding for the archaeological explorations is provided in a targeted manner from the budget of Kameno Municipality, which has set for itself the objective of turning the site into an attractive tourism destination. For 2016 it has made available to Burgas History Museum BGN 33 000, with a further BGN 5 000 of government subsidy added by the Ministry of Culture. The plans are to proceed to conservation-restoration works on the unearthed structures once the archaeological season is over. Owing to Kameno Municipality, the road to the fortress has also been gentrified, with all required amenities having been provided to the archaeologists. The mayors gave assurances that residents of Rusokastro village and Zhelyazovo village are also providing contribution to the experts’ work. The Rusokastro fortress is located in Burgas region, on an elevated hill, flanked by the Rusokastro river. It is also known as the Red Fortress due to the red colour of ambient rocks (from the Latin rosso – red, purple, and kastron – castle). Since 2006 the Burgas Regional Museum of History has consistently been exploring the site. The outcome is the uncovering of the largest fortress in today’s South-Eastern Bulgaria, with an area of 5 hectares, fortified by double walls and a citadel. It is mentioned numerous times in historical 12th-14th century sources, with scholars believing that it was constructed atop an ancient Thracian shrine.